There’s an inherent challenge in writing a play about health, medicine or science: a considerable amount of talking and stage-time has to be allocated to exposition, explanation and terminology. 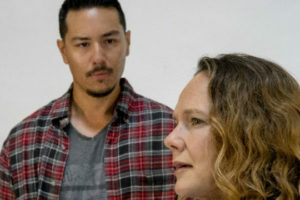 So it is with “Roz and Ray,” the 2016 drama by former San Diegan Karen Hartman, who got her start as a ‘professional’ writer when she was a 16 year-old high school student here, winning the Playwrights Project’s statewide playwriting competition, Plays By Young Writers. But Hartman, whose work has been performed around the country, is a crafty writer. She plays with time, jumping back and forth from the early 1970s to the 1990s. And she focuses her laser-beam attention on the relationship between a doctor (a pediatric hematologist/oncologist), and the single father of two of her patients: male twins with hemophilia. “Dr. Roz” tries to be “a different kind of doctor.” She has a great deal of compassion, and takes a great deal of time with her patients and their families. This setup gives her plenty of explicatory time. Still, even for those who lived through and recall that harrowing era at the onset of the AIDS crisis, it’s rough going at times through all the details of the frequent transfusions, which are replaced by what Roz thinks is a “wonder drug,” allowing for daily self-administered injections instead, even for children. The “miracle” was Factor VIII, a blood-clotting protein known as AHF (Anti-Hemophiliac Factor). Though she had her growing suspicions, Roz didn’t really know that, in those early days of AIDS, the Factor VIII was contaminated. It was a crisis indeed. Because of homophobia and the stigma of homosexuality, Pres. Ronald Reagan refused to even utter the word ‘AIDS’ for years – which meant minimal federal research money was going to the incipient pandemic. And most heinous of all (as we also learned in Larry Kramer’s searing indictment, ”The Normal Heart”), the Red Cross actually knew for two years that the blood they were getting in donations – and giving out in transfusions and to hemophiliac patients – was tainted, and therefore dangerous. As a result of the delays in acknowledging, studying and controlling the problem, as many as 10,000 people with hemophilia died. So, there’s some of the requisite background. What’s compelling about this play is the two characters – both flawed, wounded, caring, and trying to do their best. They get awfully close… stepping over the doctor/patient line at one point. But then, as disaster strikes home, the once-grateful, loving father turns into an angry, picketing protester – railing against the woman who was once considered part of his family. We come to care for Roz and Ray, and root for them. But the play raises questions of culpability for us, too. How much did Roz actually know? How much did she fear bucking the system? How much was she influenced by her lower status as a woman, not having enough clout to convince her superiors of what was happening and what should be done? Hartman sets her action in San Diego, at Children’s Hospital. The story is partly based in fact, on her own father’s experience at Children’s (he, too, was a pediatric hematologist/oncologist, seared by the fiery reactions to what was happening in the 1980s and ‘90s). The setting is San Diego, but the same scenario was doubtless occurring across the country, maybe even around the world. (After the FDA applied pressure, the tainted blood was pulled off the U.S. pharmaceutical market, but astonishingly, it was then sold to Asian, Latin American and some European countries). The San Diego Rep made an excellent decision is bringing back Delicia Turner Sonnenberg, who cut her directorial teeth at the Rep. No one is better at delving deep into character and eliciting visceral, credible, multi-dimensional performances. 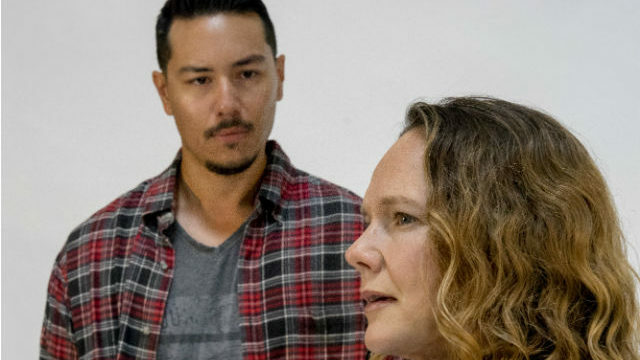 She had two riveting performers to work with: the redoubtable Carla Harting and Steven Lone (who should be seen much more often on local stages). Both create characters who are palpably riven with guilt and ambivalence – about what they’re doing, what they’ve done, and how they feel about each other. The action takes a few unpredictable turns (some that strain credulity), but we never doubt the commitment of the actors and their determination to make Roz and Ray real, aching and heart-breaking. They succeed in spades. The set (John Iacovelli) is a sterile medical environment, all hard surfaces, grey and metallic. Up above, literally hanging over the heads of the characters, are a plethora of half-filled plastic blood bags, both darkly whimsical and ominous. The lighting (Sherrice Mojgani), sound (Matt Lescault-Wood) and costumes (Shelly Williams) help define playing spaces and characters. The drama runs only 90 minutes, but it feels like it could be trimmed a bit, made more fleet and a little less bogged down in the details. Still, we come away remembering, or wanting to know more about this terrible chapter in our history. We want to cry ‘Never Again!’ But now we know we can never be sure.